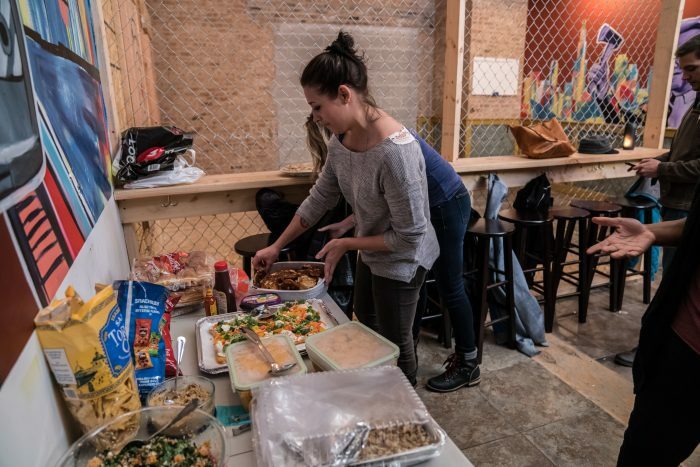 Anything but a typical office party, Bad Axe Throwing is redefining corporate & team building events with extra edge. Stepping outside of the ordinary (and sometimes bland) desk and florescent lighting environment, we provide an informal, fun-fuelled place where you team or clients can really let loose and enjoy themselves. We believe office parties and corporate events in general deserve a makeover. We’ll help you create friendly competition that will strengthen your team’s connection in an unique way, encourage support from peers and allow you to shake off the stresses of work while enjoying an epic experience together. 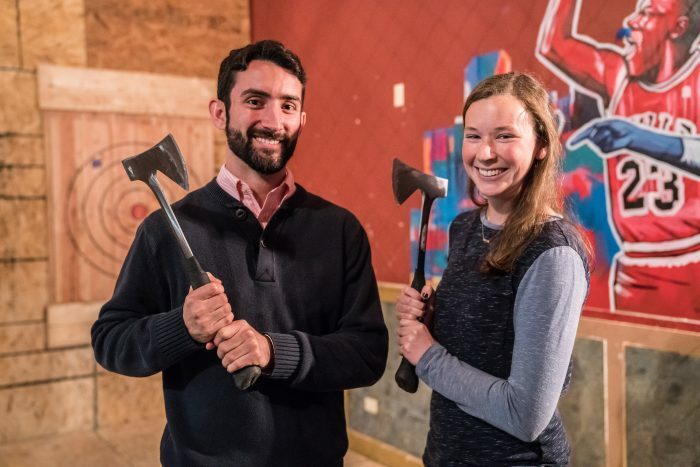 At Bad Axe Throwing, you’ll also enhance your company’s culture and increase team loyalty. After all, the team that throws axes together, stays strong together. Since axe throwing is indoors, you can book your corporate & team building event during any time of the year. Unlike golf, axe throwing doesn’t require nice weather—in fact, your team can enjoy it all season long. There’s also no need for white pants and sweater vests. We only recommend plaid and comfortable clothing to show off (or develop) your target-hitting skills. Aside from sharpening your team, you can also impress your clients with an unforgettable experience. You’re sure to make a positive impression by taking them to a cool and relaxing place that’s exceptionally different with the right kind of personality: fresh, innovative and even risk-taking (you are throwing steel blades after all). There’s no better way to bring people together than with this thrilling activity. Whether young or old, fit or not-so-fit, axe throwing is accessible to every skill level. You don’t need to have jacked arms, but you do need to like fun. And corporate teams really need to have fun after all of that TBCing (taking care of business). Like your successful business, Bad Axe Throwing has received a few accolades, including the Certificate of Excellence by Trip Advisor. They also ranked us #1 in Fun and Games in Toronto. We know not everyone is from Toronto, but you have to admit, that’s a solid record and we intend on getting it for our locations across Canada (and now the U.S.). Rest assured, your awesome team will be taken care of by the best of the best. Our dedicated corporate events planning team will help you coordinate your event and even set up the decorations if you wish. Reach out to us to book your corporate or team building event with Bad Axe Throwing. Hi! I would like to inquire about booking a corporate event at your Denver, CO location on 9/27. Please let me know if this is possible and what the next steps are t secure our spot.